This past Sunday, I caught a plane to John F. Kennedy Airport in New York City. I was invited to speak on black Union soldiers at the New York Historical Society’s NEH Teachers’ Institute, “Race and Politics in the Civil War,” which will be soon wrapping up. This institute has brought together about thirty K-12 teachers from across the United States. Monday morning, I lectured them on the history of black soldiers. In the afternoon, we watched the movie, Glory, and then Yohuru Williams of Fairfield University and I led a discussion of the film. My thanks to New York Historical Society, especially Mia Nagawiecki, for the invitation to participate. It was a great day. Before I flew home late Tuesday afternoon, I squeezed in a morning visit to Lower Manhattan to see the 9/11 Memorial and new 9/11 Museum. The terrorist attacks of September 11, 2001, long have been a matter of personal interest to me. What the Kennedy assassination was to my parent’s generation, 9/11 is to mine. I will leave it to future historians to judge better the historical significance of this event, but I will remember for the rest of my life that day, where I was, what I was doing, and the events that followed. Since then, I’ve become something of student of the event, reading many of the better books, watching most of the television documentaries, and even studying the raw video of the event gathered by NIST and posted on the web. I am definitely not a 9/11 “Truther.” I believe the attacks were perpetrated by Al Qaeda and caught the U.S. flat-footed. If one is looking for U.S. government conspiracies it is more profitable to examine how certain government officials exploited the attacks to pursue agendas formulated well before the attacks than to make fantastical claims about the attacks themselves. I also have followed the fate of the World Trade Center site, its redevelopment, and the political battles over that issue and the memorialization of the attacks with personal and professional interest. So I made an effort to get down to Lower Manhattan and make a personal visit before I left town. The memorial itself is nicely done, although perhaps lacking the simple raw impact of the Vietnam War Memorial in Washington, D.C., which has proved the dominant influence in memorialization for a generation or more. Like the Vietnam memorial the names of the dead are featured. They are etched into panels around the perimeter of where the North and South towers of the World Trade Center once stood. 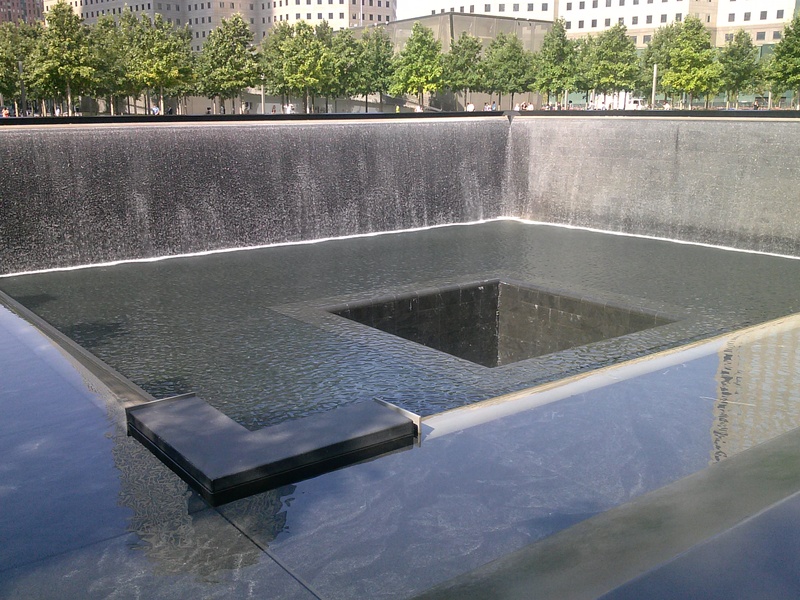 Behind them, in the footprint of each tower is water cascading downward along the perimeter into a pool at the bottom. Names are grouped with attention given to where people were during the attack and any significant affiliations, such fire, police, etc. 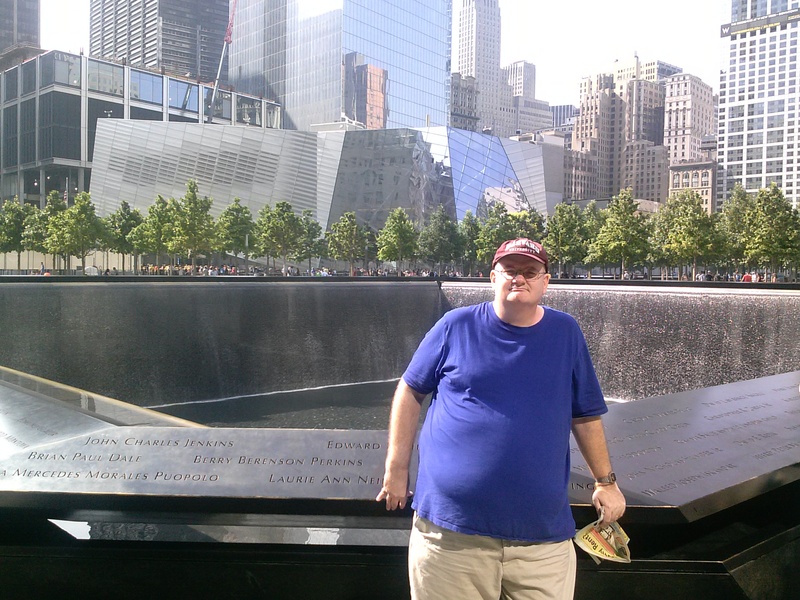 For example, the names immediately behind me in the photograph below are victims of American 11, the plane that struck the North tower at 8:46 a.m. on September 11, 2001. I noticed later that the name immediately to my right was Berry Berenson Perkins, the widow of Tony Perkins (best known as Norman Bates in the Psycho films). She was one of the few victims of the attack I had heard of before 9/11 because she and Tony Perkins’ children understandably were mentioned when he died, and she had had a career in Hollywood films, although not quite as prominent as her husband. It was kind of neat I ended up by her name even though I made no effort whatsoever and did not notice it had happened until later. The waterfalls along the perimeter of the towers’ footprints are a nice way of emphasizing their absence in a touching but non-maudlin fashion. 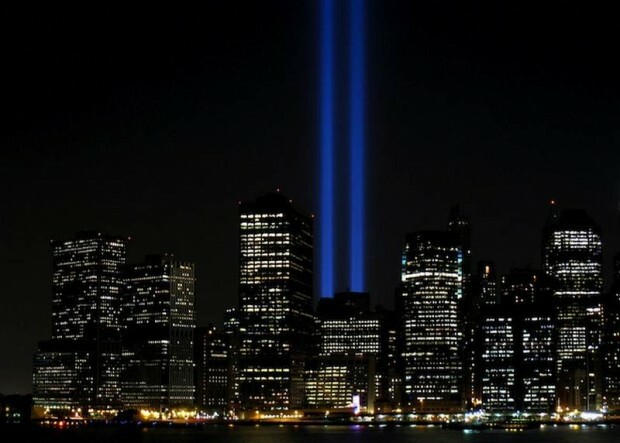 Personally, I wouldn’t have minded some element of the temporary so-called “Tribute in Light” memorials that were mounted in the months and years following the attacks, in the permanent memorial, but since that memorialization technique only works at night and with the completion of One World Trade center there is now again an ultra tall building to anchor Lower Manhattan, so not including search lights pointing up in the sky in the permanent memorial was probably a good decision. The waterfall and the trees surrounding the footprint also give the memorial a nice peaceful, almost garden-like quality. I had a friend on Facebook describe the 9/11 Memorial as “tasteful” and I’m inclined to agree. It won’t become quite the seminal memorial like the Vietnam Memorial, but given the bitter political battles over the memorialization of what is sometimes still called “Ground Zero” the outcome is nicely satisfactory, if not stunningly successful. I also had an opportunity to visit the new 9/11 Museum. My curiosity to see what was inside overcame my revulsion at the $24 general admission fee. To be fair, the museum offers free admission on Tuesday evenings, but I still wonder if the admission fee needed to be quite that expensive? I realize building the museum and memorial, and operating them are expensive, but there are world-class museums like the Smithsonian facilities in Washington, D.C., that charge no admission whatsoever. 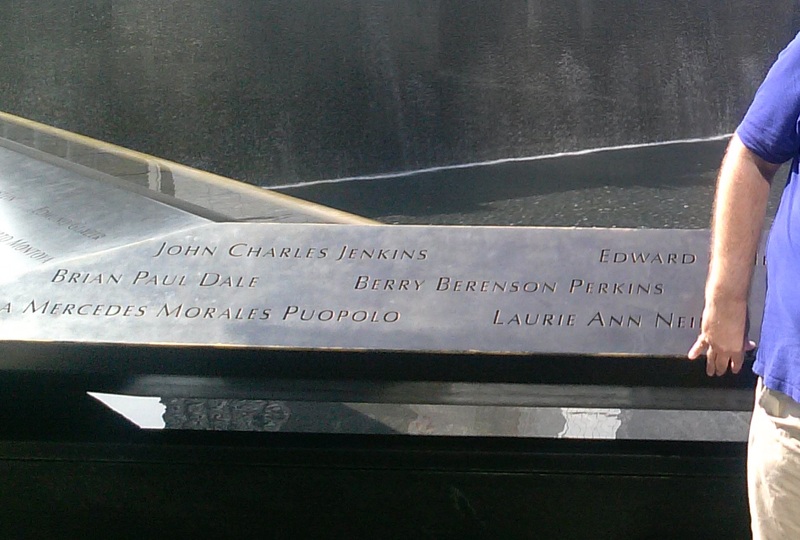 It is obvious that the visitors’ experience a the 9/11 Museum has been, for the most part, crafted with great care. Although it is possible to wander the museum at random, if you are so inclined, the exhibits lead patrons steadily downward from the entrance at ground level to the bottom of the concrete “bathtub” that was built for the Twin Towers in the 1960s to keep out water from the Hudson River. The exhibition is split into two basic parts. Most of the descent and an open area at the bottom of the museum generally contain large objects, such damaged fire trucks, and surviving elements of the Twin Towers, like twisted steel beams, that can be photographed. But at the bottom level there is in essence a closed in and regulated area, which contains much more compact and concentrated exhibits where photography is prohibited. The justification for this prohibition isn’t explained, but the controlled area uses lighting and sound much more intensively than the open area, which is generally fully lit, and my guess is that photographs in the controlled area would require flash, which would be a distraction and block the flow of people. Indeed, in this controlled area, the visitor is much more saturated with light and sound aimed at shaping the visitors’ perception of the exhibits. Indeed, the entire museum has been obviously carefully organized at every turn to influence the perception of visitors’ in an effort to communicate something of the atmosphere of September 11, 2001, in not only New York City, but also other important places in the attacks, such as the Pentagon in Washington, D.C., and the crash site of United 93 in rural Pennsylvania. As a student of 9/11, I am familiar with most of the images, sound, and media used, but to people with little or no previous knowledge, especially in the controlled area, the experience must be intense. Indeed, despite my previous knowledge of the event, the images and artifacts, and my attempt at a detached and professional perception of the museum, I still came away from the 9/11 Museum emotionally effected, leaving the building with a profound sense of sadness. So, in general, the 9/11 Museum is well done. A notable exception is the film being shown to visitors in the upstairs auditorium. The film basically is 15 minutes of George Bush, Condoleeza Rice, Rudolph Giuliani, and George Pataki sharing an abbreviated version of their by now well-known and self-serving 9/11 memories. I’m sure some people are learning for the first time what these politicians associated with the event have to say for themselves, but the film misses a golden opportunity to provide needed historical context to the event and to share the experiences of ordinary people on that day. No doubt it was politically sensitive what would be shown in the auditorium, but this film is a missed opportunity and the biggest disappointment of an otherwise well-executed museum experience. So the 9/11 Memorial and 9/11 Museum are both worth the visit, if perhaps not worth the $24 admission to enter the museum. I will be curious to see how the memorial and the museum evolve over time, especially as 9/11 becomes an ever more distant memory and perceptions of its significance are influenced by future events. But for now, it will join the pantheon of must see historical museums in the United States.